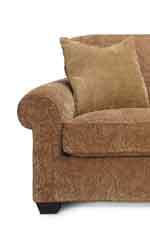 The traditional Woodrow collection brings luxury and style to your living room. Each piece is designed to complement the rest of the collection and your design. Rich padded seats and attached back, coordinating pillows and double padded rolled arms. All in all this collection flows into your design with elegance and aplomb. Browse other items in the Woodrow collection from AHFA in the area.